A week earlier, the following video ran with Cindy Goodman‘s business column about how unemployment affects families. I shot some stills along with the video (it’s always good to carry an SLR around). 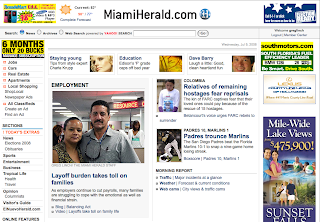 My photo of the Victor and Damaris Guzman not only ran in print on 2B but was also the main display online the morning the story ran (see left). Looking forward, I shot video and stills for a feature about a local restaurant on Friday. As always, I will post that video here. Another intern, Ely Portillo, is writing the feature and asked me to join him for the multimedia. We previously worked together on the Parkinson’s story and I think we make a pretty nifty reporting duo. Ely’s Parkinson story was great. We got a lot of good feedback on both, even being complimented in the morning news meeting after the story and video ran. We weren’t in on the meeting, but about heard it from someone who was. I’m still writing breaking news, daily news and feature stories for print and online for my internship, but I’m devoting more and more time to multimedia work and a long-term story project. A final note on video: I’ve been invited to join a new Miami Herald video task force, an offer I enthusiastically embraced. Giddy may not be the right word, but I’m pretty excited. Your videos are very well executed and deliver an intimate 3-dimensional view that enhances the accompanying print article.